Welcome to Radio Ecoshock. I’m Alex Smith with a show crammed with science that matters. Three new papers on climate change: rising emissions from our food system, seas rising 5 meters, over 16 feet in a single century, and the big bang of a meteor strike. Or listen right now on Soundcloud. Several scientist guests on Radio Ecoshock warn we will never be free of carbon emissions because our food system creates greenhouse gases. It comes from clearing forests for fields, from stirring up the soil, from petrochemical-based fertilizers, from cows and other animals (as methane), and then whatever we use to transport the food to your home. How bad are those food-based emissions? Figures vary from 20% of our total emissions, all the way up to 50%. They are large enough, and growing so much, that in a few decades all the carbon we can possibly afford to release will come from our food system. That means all industry, transportation, and products must be carbon free – or we live in a dwindling damaged climate. A new study led by Cambridge University in the UK, assisted by Scottish scientists calculates the carbon future of agriculture. I reached the study’s lead author, Dr. Bojana Bajzelj. 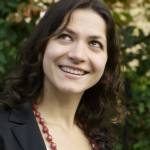 Bojana is from the Department of Engineering at the University of Cambridge. The paper published at the end of August 2014 is titled “Importance of food-demand management for climate mitigation“. That’s in the journal Nature Climate Change, a closed journal, but you can get the abstract and some of the charts in this article. The more scientists look, the impacts of overpopulation are impossible. A new study from the University of Washington projects world population by the year 2100 will be 12 billion people, 3 billion higher than figures accepted by the United Nations. Even if it’s 9 billion people, a study out of Cambridge University calculates the greenhouse gases just to feed that population will swallow the entire budget for greenhouse gases. Even at our current 7 billion plus people, we are cutting into rich biological forests like the Amazon and Congolese rainforests, to grow more food, especially for meat production. The Cambridge study predicts the world will lose yet another 10 percent of existing forests in the scramble to feed ourselves. Are you worried about losing half our wildlife in the last 40 years? Bojana tells us that agricultural deforestation is the Number One cause of loss of biodiversity. These scientists tell us that by 2050, emissions from the food system will be 80% higher than they were in 2009 (when they were already at a record high amount). I asked Bojana if their study also included a scenario where the world population went DOWN. That seems like a fair question in these days of Ebola. They did not consider this. She recommends the work of Dr. Hans Rosling on population predictions. Rosling offers many statistics on why we shouldn’t panic on population. I disagree, but you can see his video “Don’t Panic, the Truth About Population” here. When we burn or cut forests, we lose carbon to the atmosphere twice. The trees themselves are made of carbon. That is released to the air. But forests also buffer some of our carbon pollution, and we lose that too. If the population does increase to 9 billion, we have to clear more land for agriculture. That deforestation creates more global warming. Climate change causes more damage to agriculture than benefits. So climate change means we would need to clear even more land for farming, especially given the current global trend toward inefficient meat consumption. We clear more land, raise more methane producing livestock, get more warming, get more climate damage, clear more land…. and that’s the loop. The author of the study doesn’t think it classifies as a major positive feedback loop, but it is definitely another one. The really stunning thing is the need to do these two studies. Here we are with a population that keeps booming, and keeps demanding more meat. Both subjects are almost taboo with politicians who hope to get elected. There isn’t a zero-population, veggie-promoting leader anywhere on the planet, that I know of. How the heck can we get a few billion people to take off the blinders, and see where this train is headed? Yes, this problem includes you, assuming you eat food, and don’t grow it all yourself. So what can be done? food. We could greatly reduce the greenhouse gas emissions from agriculture by cutting out that waste. The second big move is too obvious. We need to greatly reduce meat consumption in the developed world, and head off that ominous trend in the developing world. China has moved big-time “up” the food chain, eating billions of tons more chicken and pork. At least those animals produce less methane than cows do. Cows are the number one biggest emitters – personally as they give off methane, but also in the huge amounts of food required to produce a single pound of beef. The relationship of vegetables to meat is something like 10 to 90. Growing vegetables producesabout 10 percent of the greenhouse gases versus 90% for the same amount of food power from meat. See my interview with Kip Anderson “Cowspiracy”. Personally, after talking with many scientists, I think any carbon budget for 2050 is not workable. By then, we must find a way to reverse our civilization, so that we are drawing carbon back out of the air, rather than adding any at all. Assuming we are going to continue eating, this study emphasizes the huge amount of carbon draw-down we’ll require just to break even, just to take out as much carbon as agriculture requires. Humans seem set to trigger a climate change at amazing speed. We could experience a greenhouse world from just 150 years of fossil-fuelled civilization. It’s likely one of the most rapid world-scale changes in nature in this planet’s 4 billion year history. We’re going to journey back millions of years, to explore the fastest mass extinction event we know much about. Maybe we’ll learn something about our future. Our tour-guide is Dr. Benjamin Blonder, from the Department of Ecology and Evolutionary Biology, at the University of Arizona. 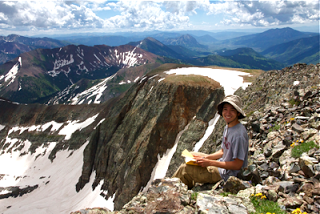 Blonder is the lead author of “Plant Ecological Strategies Shift Across the Cretaceous–Paleogene Boundary” It is published in the journal PLOS Biology, which is open to the public. Anyone can read the full paper here. Seventy million years ago, Earth’s climate was in flux, changing from ice-house worlds to greenhouse times. Then 66 million years ago, a chunk of rock 10 kilometers across hit the Earth. We think it landed on the Yucatan Peninsula of Mexico, creating a crater in the Gulf of Mexico. A kind of matter called “Iridium” spread all over the world. Iridium comes from outer space, so we know approximately when this disaster happened. Immediately there was a giant tsunami, but also a great cloud of smoke and particles that went round the world. We don’t know how long it was dark, but possibly for years. About half of all plant life on the planet died off. So did many animals, including most of the dinosaurs (except those which could fly, becoming our modern birds). The event has been compared to a nuclear winter, but much bigger. It’s thought the meteorite exploded with the force of 100 teratons of TNT. That’s such a big number. I did a little math. The largest nuclear weapon ever tested, the 1960’s Soviet “Tsar Bomba” – that was 58 megatons of TNT. It looks to me like this 100 teraton meteorite blast was the equivalent of about 2 million of the largest nuclear weapon ever made, all blown off at once. That’s a big bang. One result of that meteor impact, and this was the major point of Blonder’s paper, is the widespread deciduous plants we see today, in the Fall colors of North America, Europe and Russia. Prior to the impact, most of that region was clothed in slower-growing flowering evergreen plants. These survive today in things like ivy and mistletoe. When the sky went dark, plants had several possible survival strategies. One was to drop their leaves, and wait for the next patch of sunlight. Evergreens couldn’t do that, and died in great numbers. Plants also migrated, invasive species filled up the ecological holes, and so the Earth saw many of the responses we might see again with a rapid climate shift. It’s difficult to apply this meteor-strike science directly to modern times, because the research method cannot be more accurate than 10,000 years. That means they just don’t know what happened in 100 years, for example. The science involves the study of fossil leaves, which can tell us a lot about the ecology and biology of formerly living things. It’s similar to the work explained by Dr. Robert Spicer to Radio Ecoshock listeners in our 2008 interview. Find that here. My friend and correspondent Dr. Andrew Glikson in Australia made a time map and catalog of all the known meteor stikes during the last billion years or so of Earth’s history. Things arrive from space from time to time. is there anything stopping another big comet or meteor showing up and hitting the Earth again? Not at all, says Blonder. His University of Arizona is a leader in tracking activity from outer space, (the “Space Watch program”) – but surprises are always possible. Personally, I don’t worry about rocks from space. The most dangerous thing around here is a species that can’t live up to it’s name “homo sapiens”. Dr. Blonder says there is no point in worrying about such a meteor strike, as there is absolutely nothing we can do to prepare for it, or survive it. There may be no big strike in the next 50 million years, or it may come next year. Nobody knows for sure. In a warming world, we picture sea level rise creeping up slowly, measured in inches or milLimeters. Maybe not. According to new science, at the end of the last five ice ages, the seas rose several meters per century, more than 10 feet. There was such a case about 14,600 years ago. Eelco Rohling is a Professor of Ocean and Climate Change at the National Oceanography Centre at the University of Southampton, in Australia. He’s the co-author of the paper “Sea-level variability over five glacial cycles.” That was just published in the journal Nature Communications. As that is a closed journal, here is a good science-based article about this new study. We should stress that sea level rise comes from land-based ice, and not the more well-known melting of the sea ice cover at the North Pole. Right now, Rohling tells us, land ice is melting rapidly from Greenland, from West Antarctica, and almost anywhere glaciers are found. The recent NASA science showing that Antarctica is also losing ice mass was stunning. I covered that in my Rado Ecoshock show for May 21st, 2014. Listen to, or download that here. The show blog with links is here. The scientists led by Rohling managed to date several major de-glaciations in the last hundred thousand years, and about 120 lesser melt periods. The largest amount of sea level rise was indeed over 5 meters in a single century (over 16 feet). BUT that record amount happened when Earth was covered by more than twice as much ice as today. North America, for example, was half buried in a glacier more than a mile deep. To look at what could happen today, Rohling says we need to look at the lesser melt events. For example, there were similar size melts 240,000 years ago, and 330,000 years ago, Rohling tells us. These resulted in about 1.5 meters of sea level rise (almost 5 feet) in a single century. That’s pretty close to what the IPCC is predicting as well. Five feet is catastrophic on it’s own. Just think of the amount of delta farming land lost, the major world cities that would need to relocate, the mega-changes to nature on the coasts. And that doesn’t include the storm surges from climate-driven monster storms. Add another 20 feet or more for those. Two more things stand our for me in this study. 1. We shouldn’t even be talking about what happens in one century. Rising seas will continue for many centuries. In some case the greatest sea level rise happens 400 years after the melting begins. 2. Related to that, the past history of de-glaciation shows that once this melting process begins, it is “irreversible” (says Rohling). Past major melts were begun in part by changes in the Earth’s orbit, slowly leading to warming on Earth. The current melt is being cause by human-induced climate change. It doesn’t matter what triggers the melt. Once it’s begun, it will continue to unfold – even if humans managed to cool things down, say with geo-engineering or quitting the carbon habit. We’re committed to ever-changing coastlines already. We are imposing a constantly rising sea, an ever-changing coast line, on all humans, animals and plants to come, for hundreds or even thousands of years. It’s hard to picture a civilization where the coast is always changing. I suppose cities now by the sea, and that’s many of the world’s largest metropolises, would have to be abandoned. Living by the sea will become more dangerous, especially during storm surges. I also worry that the current melting may not follow the patterns of the past. We may heat things up so fast, that we get the 5 meters of sea level rise anyway, much sooner than anyone expects. Nobody knows for sure where this experiment with the atmosphere is leading. I hate bugging people for money. In my ideal world, science journalists and radio producers would live from some magical grant money. I don’t get any grant money, don’t run advertisements, and won’t take corporate funding. Right now I need your support to pay the bills, and keep on going. I may have to mount an official fund-raising drive. We’ll see. If you can help, please either send a one-time donation, or sign up for the $10 a month membership. Both kinds of donors have kept this radio show going for the past year. Can you help? Visit this page for details. Coming up: we’ll talk about why Progressives (maybe you and I) are part of the problem, rather than the solution. I’ve got a special on new radioactive leaks into the Pacific from Fukushima coming up. You know, the big storms that hit Japan, and nobody mentions the already flooded reactor cores down there somewhere…. Later in the month, Naomi Klein joins us. Stay tuned. That’s our program for this week. Download all our past programs as free .mp3 files at our web site, ecoshock.org. I’m Alex Smith. Thanks for listening, and please share the news about Radio Ecoshock on social media. Once a week I Tweet out the show announcement. Follow @ecoshock. I'm surprised by the anti-animal-agriculture stance that is still so popular amoung serious people who are concerned about environmental issues, like your first guest on this episode. I do understand the position from a calories in / out viewpoint. If this were the only consideration, then of course let's reduce or eliminate animals from our food system. But what about those ranchers you have interviewed on your show who have greatly increased carbon storage in their soils (from the atmosphere) directly by using animals. Of course growing corn monoculture and feeding it in CAFOs is terrible for emissions (and other environmental and health perspectives) but this does not mean we should eliminate animals. They are a part of all healthy systems. Also, what about those marginal lands not well suited for crops? Bajzelj anticipates adding (petrol-based) fertilizers to coax a crop from. But these lands are often well suited for grazing by ruminants with little energy input by humans. Without animals to build soil fertility, a lot of synthetic chemicals are needed. Bajzelj also said that it is not really possible to de-carbonize our food. Really?! From my understanding, most carbon comes from petroleum use in the form of energy inputs, fertilizer, and transport. Let's start by reducing these dependencies. Of course we can't literally de-carbonize food as it is made of carbon, but we can drastically reduce emissions related to food production. To repeat, animals are a part of every healthy system. Sorry my comment may have sounded a bit too harsh. I am not opposed to talking about reducing meat consumption. I just think we need to examine how animals are raised before jumping to the conclusion that raising animals is automatically bad. This (food production/population/emissions/positive feedback loop) would be a great topic to raise with Naomi Klein when she's on your program. For all her many virtues, she does tend to gloss over population, preferring to reframe it as solely a consumption issue, and move on. As you'll hear in the Radio Ecoshock show released October 29th, I did ask Naomi about population. As you said, she turned it into a discussion about consumption.